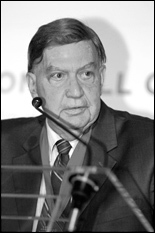 Past Innovation Hall of Fame inductee Harry B. Smith speaking at the 2006 induction ceremony, where he received a medallion comemmorating his own induction in 1987. Harry B. Smith, M.S. '49, electrical engineering, died on August 8 at the age of 86. Smith's invention of pulse Doppler radar earned him the David Sarnoff Award and IEEE Pioneer Award, and induction into the Clark School's Innovation Hall of Fame. He led a highly successful career, serving as president of the Westinghouse Defense and Electronic Systems Center (later acquired by Northrop Grumman), and launching APEX/ECLIPSE, developer of technologies to improve the signal-to-noise ratio of communications systems. Smith received the Clark School Distinguished Alumnus Award in 1982. Smith is survived by his wife, three children, four grandchildren and his brother. Visitation will be held on Tuesday, August 12 from 7-9 p.m. and Wednesday, August 13 from 3-5 p.m. and 7-9 p.m. at the Sterling-Ashton-Schwab-Witzke Funeral Home, 1630 Edmondson Avenue, Catonsville, Md. 21228 (410-744-8600). The funeral service will be held on Thursday at 10:30 a.m. at the same location. Interment will be in Loudon Park Cemetery.